You are here: Home Forum Home Glasspar G3 Free 1960 G-3 in Ontario. Free 1960 G-3 in Ontario. TOPIC:	Free 1960 G-3 in Ontario. This hurts but I've come to grips with the fact that restoring this 1960 G-3 Center Deck Ski Boat is beyond my budget and my knowledge. I finally got my "other" boat in the water and I'm going to focus on bringing the Humber back to as new. This means I am giving away the G-3 to any member who can come get it. The stringers, floor, transom and just about everything else need the kind of love I ain't got. I have a trailer that can go with it but I'm not prepared to swear to it's road ready state. It's not but if you're going a SHORT distance it'll get you home. It's FREE on the condition that you RESTORE IT. If you take it from me and sell it we'll have an issue. I'm looking for that forever home for her and someone who can bring her back from the grave. If you can do it, it's yours. The boat is located in Paris Ontario Canada. P.S. the trailer in the picture isn't the one that's available. This was actually worse so I rebuilt the whole thing and I'm using it for the Humber. The other trailer is adjustable 18 ways to Sunday but it has a wrong hitch and there are a couple cracks in it. If you are in need of a project, you are welcome to her. Trying to talk the wife into Snoopy 3 . Sold Snoopy 2 to Tim Nicholls marine he wanted it for his cottage up north. Already have a 15ft aluminum boat I am redoing for the wife's uncle and then I just got a 1980 Glastron CVX 16 that is next in line for a restore. I have a plan to find a 14ft Kennedy ski boat with a deeper V bottom and graft that to the bottom of a G3 to get a better smoother and faster ride but still retain the G3 looks above the water line. Since my dream for that boat was to fly her down the Niagara, keep talking and add flowers. I'm most interested in it having a life again and half a life is better than the boneyard. The trailer would make Fort Erie I'd say but you'd be wise to take Hwy 24 from Paris to Hwy 3 in Simcoe and left to Fort as you wouldn't have to exceed 80 and there's not a lot of cops to notice it 's got no fenders and the hitch mount is welded on TOP of the trailer neck. Who does that ??. lol. I haven't been to Nicholls in ages. Didn't know it was still there. Let me know how it goes. Mark. 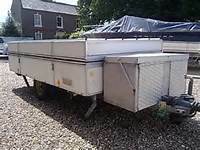 This is the trailer you can have with it. It's rough but I think it's worth saving, just not to me. There's a couple weak spots in the C channel but you can box that like I did with the other one. Cost me 60 bucks to have the steel bent and cut and then my buddy welded it all. This trailer neck is a tad scary not to mention illegal. You guys decide. you'll need magnetic lights and I'm not going to promise the tires are worth a darn either but we towed it 50 miles like this with the Humber on it and it stayed together. Last year I posted about it in trailer talk, I was going to cut the neck off the trailer I'm using now and weld it on but decided to save the other one as it was cheaper to rebuild. Have a great day all. The good news is I found the G-3 a new home where it's going to be rebuilt by a pro and overpowered like it should. The bad news is I no longer have a G-3. But the gentleman did manage to make my day by giving me a small camping trailer for the boat so I came out with something anyway. 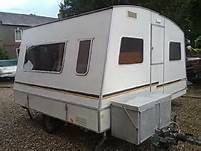 It's called a Rapido Caravan and they seem to be quite popular in Europe. The beauty of it is it folds down very small and I can tow it behind the convertible !